THIS GAME IS NO LONGER UP ON THE GOOGLE PLAY STORE. IF IT IS EVER PUT ON THERE AGAIN, THIS MESSAGE WILL BE REMOVED FROM THE DESCRIPTION. IF I DO PUT IT BACK UP ON THERE, I'LL REMAKE THE ENTIRE GAME. 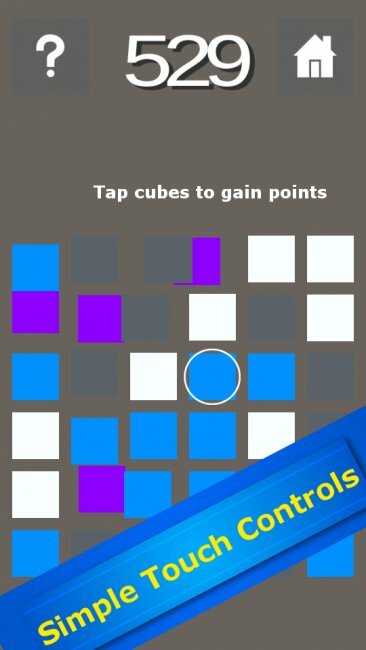 Click Click Cubes is a simple, and addictive game. It's a game, in which you must click cubes, each coming with their own traits. You must tap the correct cubes, and you must tap them quickly. This game will test your reactions, so be ready! This game works without WiFi, or Mobile Data. This means you can play this game off-line without any internet connection at all. You can play it anywhere without needing to worry about your connection. Show your friends how great you are at this game! This game isn't a turn based game, and this game will test your reactions. Many of the cubes within the games have a cooldown, and if you aren't fast enough, a cube which could have earned you points, may end up costing you, or even worse, make you lose out on a potential high score. This game has no preset levels. This game starts off with one cube, and progresses to a 6x6 grid of cubes, spawning more cubes as you tap on cubes. This means this game will be different every time, and you'll have to figure out what every cube does in order to get a high score. Good luck! This game is mostly randomised, with various things within this game happening within intervals, for example, a bonus stage (Whenever all boxes are cleared, and a green box appears) occurs at 50, 100, 200, 400... points, and it keeps on doubling. There are currently 8 different cube types within the game, and there may or may not be more within future updates. Each box type comes with its own unique attributes, and provide different effects. Figuring out how each box type performs differently from the rest is key in getting a higher score. Have fun, and thank you for playing my game!